It’s no secret that we love peanut butter here on Turnips 2 Tangerines. I mean loove the stuff. I can and will and often do eat peanut butter every day. I can hardly keep the stuff in the house. I eat peanut butter by the spoonfuls, literally. Who needs bread! My biggest downfall is peanut butter on graham crackers, dunked into a glass of milk. Seriously, I can’t have the two together in my house. I’ll eat a box of graham crackers with peanut butter, no problem. My hubby is a huge fan of the childhood classic, “Ants on a Log.” Me on the another hand, not so much. Why? I have a thing about eating raw celery or as my hubby calls it, salary. For some reason, every time I eat raw celery it seems to get caught in my throat. Every. Single. Time. Don’t get me wrong, I love celery and use it often but I won’t eat it raw. No celery sticks here. I try to avoid eating raw celery at all costs but I like Ants on a Log, just not the log part. So this recipe was born. Bagels vs Apples. 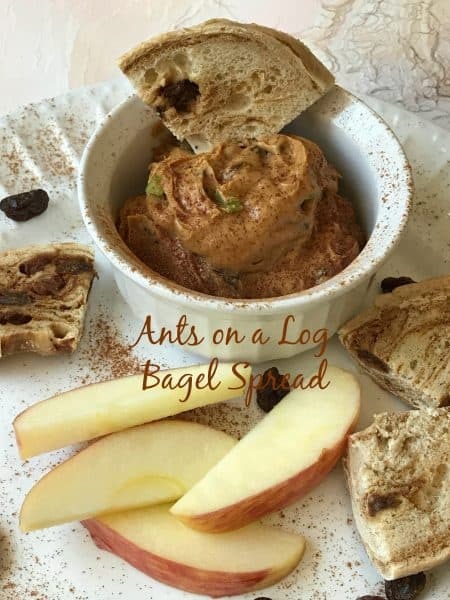 My hubby preferred “ants on a log spread” on a toasted cinnamon-raisin bagel. Whereas, I preferred dipping an apple slice into the spread, which would then make it a dip, I suppose. Like I stated, my hubby is the “ants on a log” expert. He really liked the whole idea of this being a spread/dip vs a log. I too, thought this was super good, much better than eating peanut butter smeared on a piece of salary. 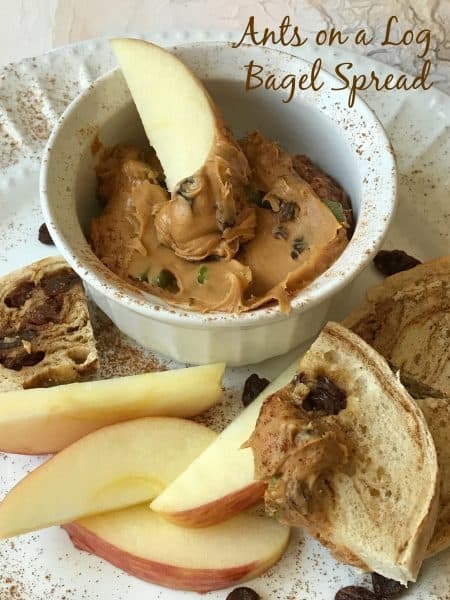 This fast and easy recipe will be a great snack for kids. I think many kids have the same problem or maybe fear of choking on a celery string as I do. But with this dip, there is no need to worry about that. 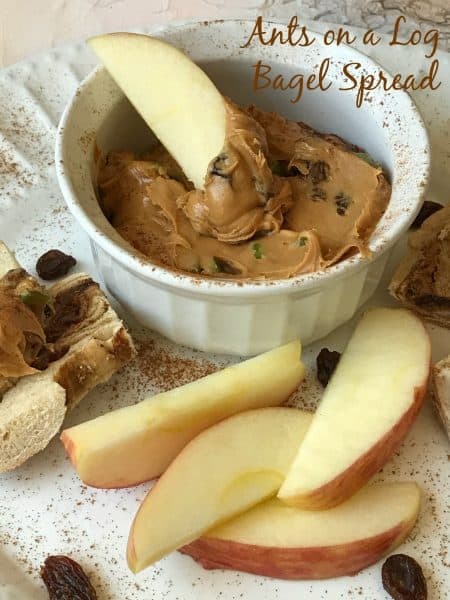 It’s a great way to get kids to eat apples besides the usual ‘caramel dip’ option. Mini bagels would be great with this dip also. Purchase a variety of your kids favorite mini bagels and let them get nuts! This childhood favorite is the perfect protein-packed pick-me-up. 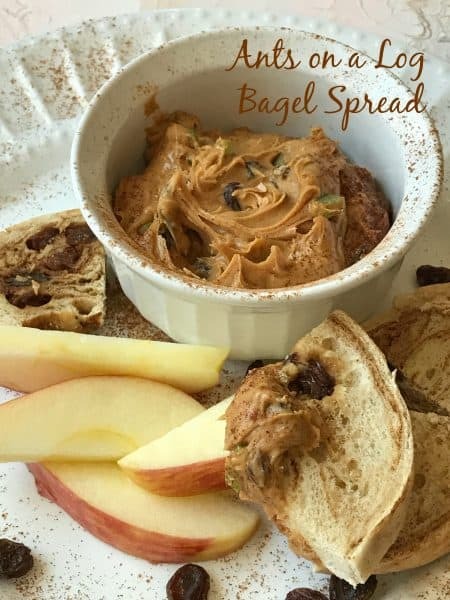 Serve with apple slices, cinnamon-raisin bagels or English muffins. In a small bowl, combine the celery, raisins, peanut butter, honey if using and ground cinnamon. 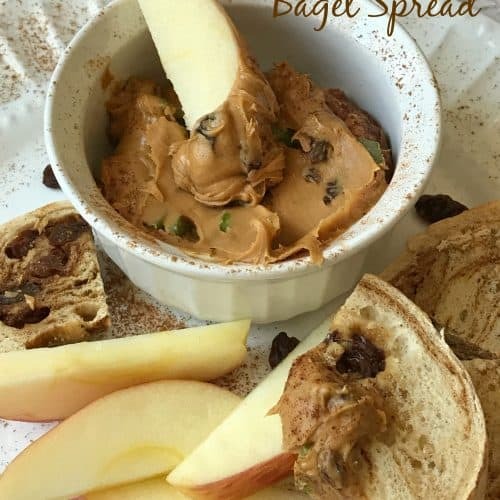 Serve with apple slices and cinnamon-raisin bagels. *This recipe can easily be doubled. Adjust the ingredient amounts to suit your tastes. We liked this spread on the creamier side. High in fiber and a good source of iron and potassium, dates are one of the sweetest fruits; 70% of their weight can be made up of sugar. To prevent sticking when slicing or chopping dates, spray a knife or kitchen scissors with cooking spray or frequently dip in cold water.